On November 29, Taiwan will experience its own ‘mid-term’ elections. This time unprecedented for at least three reasons. 1) 6 mayors of the Special Municipalities (Taipei, New Taipei, Taichung, Tainan, Kaohsiung and the newly upgraded Taoyuan City, formerly Taoyuan County). 9) 50 indigenous district councillors. Naturally, the most attention will be given to the six special municipalities, three cities and thirteen counties as they altogether represent totality of Taiwan’s electorate and second tier of governance in Taiwan. Of those, the six special municipalities are on the top of the prize list. They represent a significant portion of the electorate and are major centres of political and economic power. Out of 18.5 million eligible voters, almost 13 million are registered to vote in one of the six ‘super cities’. This is not to say that other local elections do not deserve attention. As the recent experiences with land-grabbing in Dapu demonstrated, local issues may resonate strongly at the national level and matters of procedural justice are often felt there first. Moreover, while DPP competed well on the special municipality and county levels in 2010, it fared poorly at lower levels, winning only 220 ward chief positions compared to the KMT’s 1,194. Thus, it will be interesting to observe whether the expected overall DPP victory will also be manifest at the very local levels of governance. Arguably, the KMT is better positioned, thanks to its wealth and decades-long local patron-client networks, to perform well in these constituencies. Should the KMT start losing its dominance there too, it would be real reason for the ruling party to worry, not only in terms of national elections in 2016, but for the future at the local level. Secondly, the marquee campaign for Taipei City mayor is extraordinarily interesting. The KMT does not have an incumbent candidate, but Sean Lien, son of KMT honorary chairman Lien Chan, should have been enough strong enough to win this traditional KMT stronghold. But this time round the KMT candidate is not running against the usual opponent from the DPP but a well-known National Taiwan University Hospital physician Ko Wen-je standing as an independent. An unusual “anyone but the KMT” alliance of the DPP, Taiwan Solidarity Union and People First Party (the latter traditionally part of KMT-dominated blue camp) have expressed support for Ko, who has managed to preserve his image as independent candidate. Previously, elections in Taipei City have appeared to be somewhat boring democratic exercises of democracy with the result seldom in doubt. 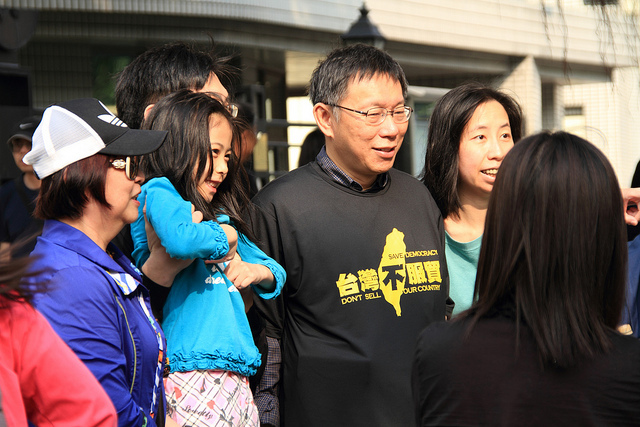 Taipei is a core KMT stronghold and as noted previously on this blog, and unless the KMT (or Pan-blue camp in general) supporters split votes, victory in Taipei is usually out of reach for opposition candidates. It appears it won’t be the case this time and although observers tend to be rather cautious (partly out of disbelief that KMT could lose Taipei), Ko Wen-je is looking good to become the next mayor of Taipei. What about the rest of the special municipalities? Incumbents in Kaohsiung (Chen Chu, DPP) and in Tainan (William Lai, DPP) enjoy leads in the polls so great that their victory is given. The same applies to KMT’s Eric Chu (potential KMT’s presidential hopeful) in New Taipei. KMT is also likely to win in newly created Taoyuan City. Thus, the second most interesting race appears to be happening in Taichung where, according to polls, the KMT’s veteran Jason Hu is fighting an uphill battle against his DPP challenger Lin Chia-lung. Hu won by very narrow margin of 2.24% (or less then 2,000 votes) in 2010 and this year may conclude his 13 year long rule in Taichung. The debate will be to what extent these elections reflect respective parties’ prospects for 2016 legislative and presidential elections. Granted, some local politics is indeed local and extrapolating local elections results to the national level is generally inadvisable. But elections so huge in scale will inevitably resonate on a national level and the Taipei elections in particular inevitably address the more general political divide. Brace yourself, elections in Taiwan are coming. This piece was originally published on China Policy Institute blog.